January 14, 2015 – It’s day 14 in our 365 Days of Pet Sitting and it’s time to look at the small animals in our practice! Although our day was busy with seven visits (even after two cancellations!) over the lunch period, and our multi-dog family is now tucked-back-in here at our house for a few days…the only small animal to be found anywhere today is our canary, who is now off to bed in the spare room. But the little ones are out there and they might be calling on you for a pet sitting visit any day now! The most common characters you’re likely to see are birds, fish, guinea pigs, hamsters, and rabbits. We’ve been asked twice to come by to feed a snake…a live mouse…but that’s just not for us. We’ve also never taken-on terrarium animals such as turtles or lizards. When you’re popping-in to walk and feed the dog during a vacation pet sit, that’s when you’ll most often be asked to look after the little critters too. It’s essential that you’re honest about any lack of experience with certain animals. I might not be super keen on lizards, but if I had any experience with them I’d probably take the assignment. I’ve never looked after one and feel less qualified than I do with larger animals, so neither of us would be happy with the arrangement at this point! If you have never lived with a bunny in your household, on the other hand, you might still feel comfortable looking after Bugs while the family is away. Rabbits and guinea pigs still have that furry four-legged thing happening we feel good with. But if you don’t like iguanas…even behind glass…and the family doesn’t mention him until after you’ve arrived at the dog’s meet and greet, feel free to decline. Of if you’re not the assertive type, tell them you were not expecting an iguana and will think about it, listen attentively to the directions, take lots of notes, and keep an open mind. Maybe they’ll make it a breeze for you. Or else you can call back that night or the next day and decline. Don’t wait! They need to find someone else. It might mean you lose the whole job, but it’s better than feeling worried for weeks ahead and all during the holiday. Believe me! All newbies bite off too much at some point! Does it sound as though I don’t like birds? Not at all! We had budgies for years when I was young, my husband and I love our newly adopted older canary, and we go through close to 30 pounds of sugar from May until September feeding the hummingbirds that visit our home each year. But I also have a healthy respect for them. They’re fast – and the ones in cages know they’re cornered – so if they don’t know you, watch your hands! Canaries do not feel comfortable being touched, so they’ll move away from where you’re working. Your big focus here is not to alarm the poor wee things. Budgies do like to land on you – and if they are used to doing it, they might light on your hand as you work. Steel yourself before putting your hand in the cage if you’re not used to this. The automatic reaction is to shake your hand and you’d send him spiraling! (Did you know a bird’s claws are cold? It’s a funny feeling at first.) Watch out for the escape artist. Budgies often spend their day outside their cages when the family isn’t home but you don’t have time to chase him around the room…or house! 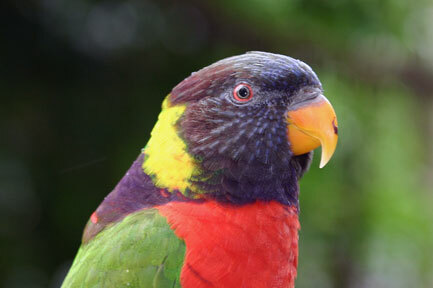 Larger birds such as Lovebirds, Cockatiels, and Parrots can do damage if they claw or bite you – and they don’t need a reason (that is apparent to you at any rate…I’m sure there is one.) One of my budgies would bite my fingertip every now and then and it hurt like crazy. I wouldn’t want to be on the other end of a big bird’s beak. If you’re asked to look after larger birds, and it necessitates putting your hand inside the cage, I’d suggest you do a dry run with the client and take good notes about the bird first. Don’t underestimate birds. They’re highly intelligent, watch everything you do, and learn quickly. Most animals enjoy a little music and birds are no exception. If you can leave a radio on, low, all animals have great hearing unless they’re getting old, then they’ll be grateful to you during the long boring days when there’s no activity in the household. Small animal pet sits can be very rewarding and they give you the opportunity to enjoy wonderful, playful, smart, curious, new kinds of animals. We’re so very fortunate in our line of work. Where other people might say they don’t like birds, or cats, or dogs… we take on their care even when we’re not quite sure how we feel about them. And even if we’re still not sure they’re our favorites by the end of our adventure, we can’t help but appreciate them and all they have to offer. They give us a new respect for them, and that change our perspective forevermore. Just one more thing we’d never know if we didn’t go in with an open mind and heart.